Our homestead was bustling this weekend. The weather finally broke and we could all move about on the roads and take care of outdoor chores far more easily. We were flooded in on Thursday, shivered through both rain and snow on Friday, and then a big snow and ice storm that caused Level 2 emergency alerts, on Saturday. But on Sunday, we had unseasonably warm temperatures and absolutely no precipitation of any kind. A collective “Woohoo” was surely shouted by everyone who lives in our region of Appalachia. The mud bog conditions have not waned here on the homestead, and more rain is on the way this week, but we are going to enjoy the heck out of the 70+ degree temperatures headed our way for the next five days. You can experience all four seasons in a single day – though some folks argue we only have two seasons, winter and construction. Don’t like the weather? Stick around for 15 minutes and it will change. 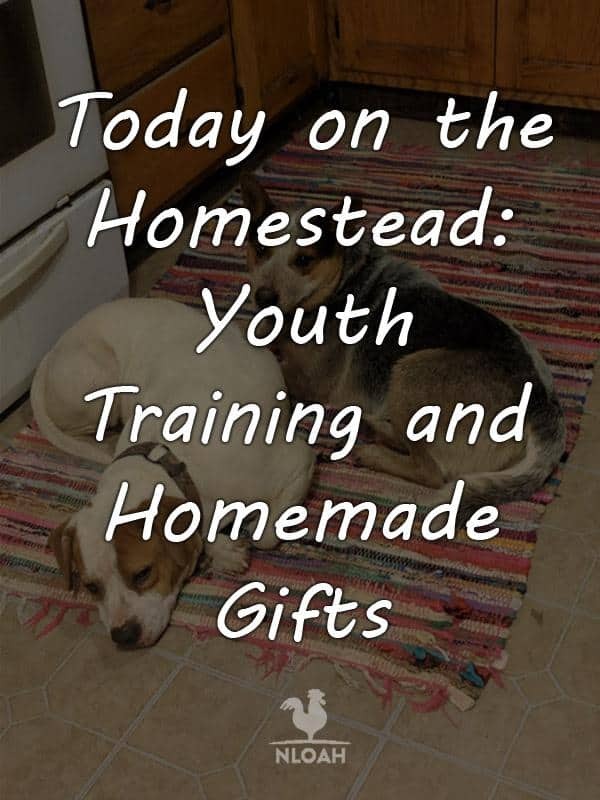 When the weather is decent, our homestead is a happening place. Bonfires, smoker brewing up something delicious in the shelter house, horseback rides, ATV adventures,foraging hikes, and a series of other projects being tackled by friends and family that double as a lot of homespun fun. But, during this incredibly harsh winter, the homestead was so often devoid of such joys. The roads, and especially the winding uphill journey along our ½ mile dirt drive was just too treacherous, even for 4-wheel drive trucks and SUVs everyone around here owns. Sometimes, folks couldn’t even get out of their own properties because of all the ice on the roads. If the roads were passable, all anyone wanted to do was cuddle up with their woods stove after rushing home from work to get outdoor chores done before dark. Finally, all of that changed on Sunday, and it felt like old times on our homestead, that I lovingly refer to as, Serendipity Acres. We didn’t plan a gathering, it just sort of happened, like it always does when the weather is nice. Folks were going this way and that, having fun doing chores while trudging around in the mud. Sunday did not start off with a good note, though. The oven door broke, which made putting bacon on for the standard weekend big breakfast a bit problematic. My Bobby loves his bacon cooked in the oven instead of fried in a skillet. I thought that was odd the first time we made breakfast together, but after trying it, I completely agreed. Well, thanks to the oven door and a worn spot I did not know existed in my oven mitt, I burnt my thumb deeply when lifting my cast iron griddle out of the oven. I was once a feral wife that only knew how to make tacos, spaghetti (from a jar) and Hamburger Helper, at least indoors. Outside, over an open flame or camping stove, I was a gourmet cook. My clever hubby bought me a massive set of cast iron cookware to inspire me to cook indoors, to think of it not as a mundane domesticated task, but as a happy activity just like it was when I camped. It worked. I will never be the cook my mother is, but I can make all kinds of dishes now. Oddly enough, I could always make any kind of dough from scratch, the only aspect of cooking or baking my mother struggles with. After breakfast was finished, me and my sore thumb spent some time making a homemade birthday gift. I LOVE my embroidery machine, thanks again, Mother! At first it felt like cheating when I used it, that I was not really creating something, just hitting buttons on a fancy piece of technology that anyone without a single ounce of talent or imagination could do. But, I have gotten over the cheating feeling now, almost entirely. The ease in which I can make and mend useful items and the ability to make even more homemade gifts, soothed my anti-tech angst. I have come to believer (or at least, convince myself) that the machine has not stripped me of creativity by doing the stitching for me, the creativity comes from how I choose and layout the designs for the projects I dream up in my head. I have been working on making a gift to celebrate our granddaughter, Audriella Vivianne (Auddie) turning two. She was born on Leap Year, so we celebrate her big day at the end of February. Our son-in-law does not have to tax his brain very much to remember birthdays, only his own and our youngest grandchild, Ariyah, have non-holiday birthdays. Brea’s birthday is on the 4th of July and their oldest child, Colt Remington, was born on Christmas morning. The Waldorf style bendy doll family I have been making for Auddie is almost finished. They need prettied up a bit and I still need to add the daddy doll. A still in the works teenage doll will be completed later today. 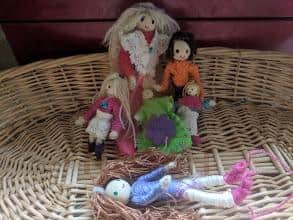 Even the middle school age daughters of a fellow homesteading friend who came over on Sunday, couldn’t help but fall in love with the simple little dolls. They were so surprised at how easy it was to make your own dolls. I made them each a kit to take home with so they could create their own dolls to play with or use as a decoration in their bedrooms. The dolls were made out of 1-inch wood beads, pipe cleaners, yarn and embroidery floss, and felt or lace scraps for clothing. I am also making Auddie a fabric dollhouse style purse to keep her new doll family in. I used the cardboard pattern I made to form the sides of large fabric dollhouses I made at Christmas to create the purse. 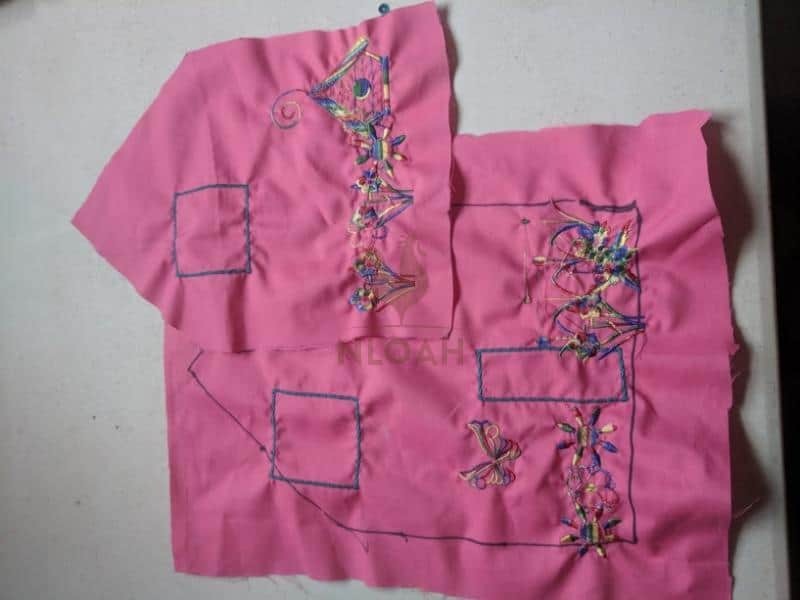 The side panels from the larger dollhouse will be front and back panels of the purse, with the front portion folding down to reveal the dolls and house features inside. Auddie loves the fabric dollhouse she got at Christmas, but as a stationary play thing, It is just too big for her to tote around yet and that little girl sure loves purses. Her other birthday gift will be store bought – a pink and camo ride on 4-wheeler. The blue shapes are windows and doors. The out of the pattern oops with one of the windows won’t be noticeable once I add some lace for curtains. The side panels of the purse will have a barn and horses, Auddie loves horses even more than she loves purses. Once the panels have been ironed, some strings cut away from the designs, and sewn together to make the purse, the puckering will not be a visible issue. One of our young visitors this weekend is already an avid seamstress. She made a blanket for her baby sister and couldn’t hardly wait to get her hands on my embroidery machine to add some cute designs to it. Everyone got a chance to learn how the machine works and press the buttons. Afterwards, they all gave me a long list of what they wanted to make, followed by a flurry of questions about what designs I had to use. I lucked into a flash sale on one embroidery website and scored 12 design collections for only $12. Each collection had between 15 and 40 designs in it. I chose finger puppet, pirates, and fairy tale characters to use when I make quiet books for Christmas presents later this year. The rest of the 300 or so designs I now have stored on a jump drive that plugs in the embroidery machine were all freebie downloads I find while scouring the internet. That is exactly how I accumulated almost all of my sewing patterns, too. Our impromptu training sessions with a variety of kiddos did not end with the doll making and embroidery lessons. We planned to tap some more trees for syrup yesterday, so my homesteading friend Sarah, Brea, and all of the children helped with that too. The guys went off to split more wood and move hay while we tapped trees. They had a mishap with the hay, but more on that later. Pretty girls who can use power tools make the heart of any true country boy melt. 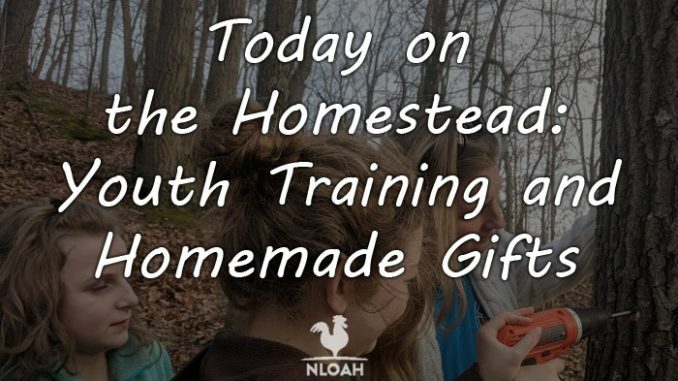 These young ladies know their way around the kitchen, garden, barn, AND power drills. I imagine their momma, Sarah, who can pull the choke on a chainsaw and cut firewood all by herself, while her homemade pie is baking in the oven, began teaching them at an early age. Each child, even little Auddie, was given tapping supplies to carry while we hiked around the property in search of more good trees to tap. We did not do the smart and easy thing, mapping out and marking trees BEFORE their leaves fell off. So, the hike also turned into a bark identification lesson, as well. 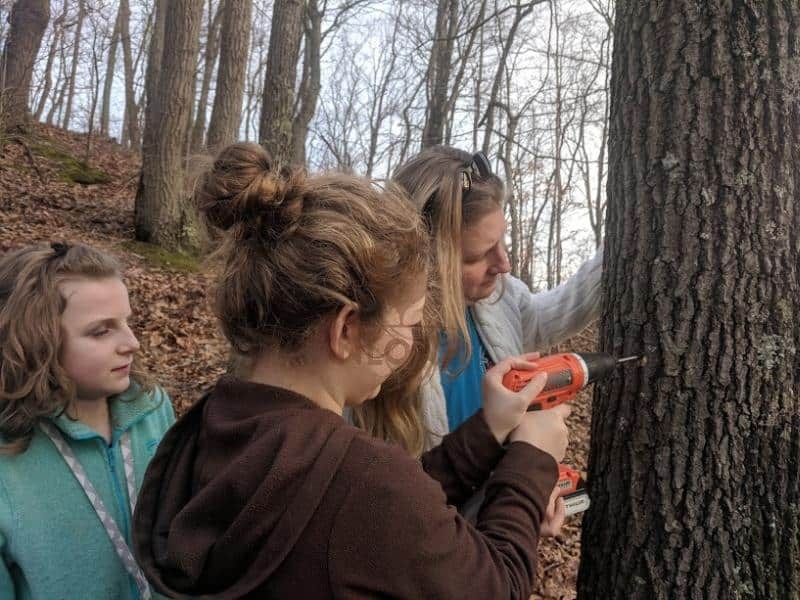 The identification of one tree in particular sparked a rather heated argument between Sarah’s son, who has more years in 4-H under his belt that his sister, and is also a member of FFA and nearing completion on his Eagle Scout badge. Well, dear homesteaders, any of you that are kid sisters like I am, can clearly imagine the smirk on Meg’s face when she was proven right and her older brother was proven wrong! We tapped not only hard and soft maple trees, but a few non-maple varieties as well. This winter has made it very difficult to tape trees. The weather has to be above 35 degrees during the daytime and below 35 degrees at night, to tap. The tree tapping season usually has a narrow mid-February to very early March, window. This year, we were below 35 degrees during daylight hours almost the entire month, we surely were not blessed with two consecutive above 35 degree days, that’s for sure. How successful our tree tapping efforts will be this year remain to be seen. But our entire tribe now knows how to choose trees, tapping spots, proper spile (spout) pounding techniques, a little more about identifying trees based upon their bark and how it can be used medicinally. I received a text from my Bobby while we were tapping the final tree. Even though I reminded him and the rest of the guys, far more than once, NOT to let the horses get out of the gate when moving around hay, that is exactly what happened. My Ruby and Sarah and Arnie’s, Daisy – the herd boss and her “henchmare,” supposedly “bolted” out of the gate and up into the upper pasture. Serendipity Acres is basically a four-tiered homestead. You go uphill a certain number of acres, it levels off, rinse and repeat, until you get to the upper acreage. I figure they guys tried for quite a while to get the horses back where they belonged before texting me to admit their defeat. Sarah and I hiked from in the middle of tier two of the homestead up to tier three, a ½ mile back to my barn, and then to the upper tier. I say hike, but the third-leg of our journey was more like wading in quick sand thanks to the still present mud bug that tries to separate me from my barn. Arnie offered to ride us up top in his Dodge truck, but we declined. Halfway up the hill, we decided we should have accepted his offer. The Blue heelers and Brea’s pitbull ran ahead of us like the terrain was neither rugged nor muddy. I am surprised Daisy could run so fast, I am nearly positive she is with puppy. Daisy, the dog not the horse, came into heat just days before she was scheduled to be fixed. 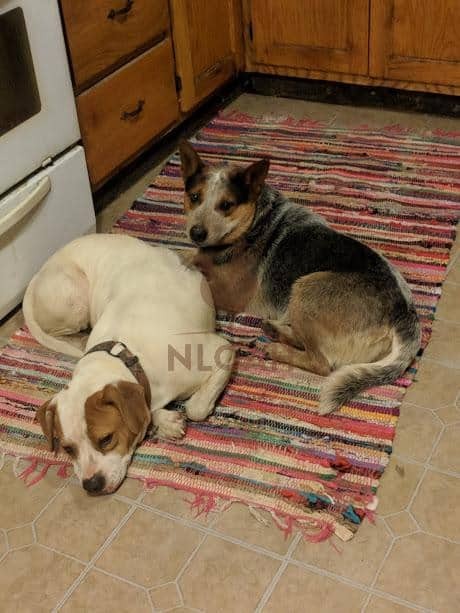 I believe our efforts to keep her and Bobby’s blue heeler, Ruger apart, failed miserably. Photo above: canine love birds, Daisy and Ruger. “Blue Bull” puppies coming soon! When Sarah and I got to the top of the hill, there were my Ru and Daisy, munching on what passes for grass this time of year. I walked over to Ruby and did a repeat of my actions when she and the herd went walkabout for two miles and wound up at Lake Rupet in December. “Git for the barn,” I said sternly, while pointing in the appropriate direction. She truly did bolt this time, with Daisy, the horse, Daisy the dog, and both blue heelers, hot on her trail. With all of the dog barking over the running horse excitement, I did not hear Bobby coming up the hill on the four-wheeler. He thought we would need it to herd the horses around the upper 15 acres to get them to go back to the barn. Thankfully, the menagerie of animals veered off the narrow road and up onto one of the tall banks that border it, to continue on their high speed travels directly to the barn. After all of the horse excitement had subsided, there were two, slightly more calm, lessons taught on the homestead this weekend. I discovered a round had neglected to expel out of my .22 Henry level action rifle earlier in the morning when I followed the barking dogs into the woods by our campground. The sound they were chasing seemed to belong to a young coyote. There are very few of God’s creature that a begrudge the ability to walk the Earth, but coyotes and mink are chief among them. I followed the dogs on the four-wheeler as far as I could, and then got off and hiked after them. When they pinpointed the noise again and returned to me when I called, I attempted to fire in the direction of the coyote. It was between the campground and the chicken coop – it does not belong there…at all. That is when I discovered the last person who shot my rifle, a teenager that is now very aware of my displeasure, had a round that did not expel. I reached in my barn bag for my handgun, fired at the coyote, missed, and watched it run off away from our property – at least for now. I worked for about 20 minutes to get the round out of my rifle, but it simply refused to budge. It took Bobby only about five minutes to remove the stuck round and the one that was into the barrel entryway that now also have pry marks on it. All of my hard work must have loosened up the stuck round and allowed Bobby to remove it so easily, I’m sure that’s it. I had a video of the burning gun powder, but somehow accidentally deleted it when snapping some cute photos of the grandkiddos playing in the mud. 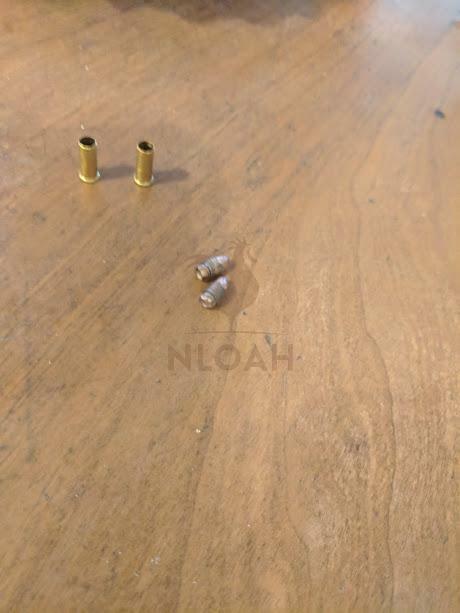 You cannot reload .22 caliber rounds, but you can take them apart and melt down the brass to fill molds when making casings for larger rounds. Bobby, being a firefighter, did not want the rounds tossed into the burnables trash can. He took the rounds apart to teach all of the kids about the parts of the round, how they work and what they are made of. After teaching the children about the components of gun powder, he poured it onto a brick and set it on fire. Watching the quick spark and burning was thrilling for the kiddos (I have always enjoyed playing with fire, and have to admit I found it was fun to watch, as well.) and will likely help them retain the important parts of the lesson for a long time. Before starting dinner and sitting down to enjoy a Walking Dead marathon that was on television, I fixed up a natural medicine “go kit” for Sarah. She has been sick for almost two weeks, and over-the-counter medications were doing absolutely nothing to eliminate the symptoms of the common cold. She went home with a Mason jar of colloidal silver, my homemade chest rub (2 parts coconut oil and 1 part each eucalyptus oil and lavender) as well as turmeric, oregano, and cinnamon spices to mix in with her food. I predict she is feeling a lot better by now. What did you do on your homestead this weekend? Tara lives on a 56 acres farm in the Appalachian Mountains, where she faces homesteading and farming challenges every single day. her homesteading skills are unmatched, she raises chickens, goats, horses, a wide variety of vegetables, not to mention she's an expert is all sorts of homesteading skills such as hide tanning, doll making, tree tapping and many, many more. "Hi! I'm Kendra. I'm a wife, mother, and homesteader. I love everything that has to do with simple living. I'm a canning instructor, an avid gardener, and a constant learner of old-fashioned skills. Here is where I share it all. Welcome to the adventure!" How To Easily Convert a Chest Freezer to a Fridge For Solar and More! Leftover Oatmeal: 10 Delicious Recipes To Help You Use It All Up! This site may earn commissions when you click on certain links. You should assume any link is an affiliate link. We are enrolled in the Amazon Associates program, so we may earn a commission if you purchase something from Amazon after clicking one of our links. Some of the reviews on this site may be compensated by the companies who’s products were reviewed.